Hi everyone I created this card from the new SVGCuts kit, Garden Nouveau. This set offers a watering can album, a card and a wonderful butterfly lantern for use with a battery light, so pretty. I definitely have to make a couple of the lanterns, they would look great at a party. For the card I welded two fronts of the watering can together and just assembled the pieces to the can and attached to the front of my welded card. So simple, love it!! All the cuts are from the kit, just click here or the banner at the top and get your kit today, if you spend $9.98 and add the kit to your cart use code FREEGIFT and you will receive it free, can't beat that. Hi, Bridget! 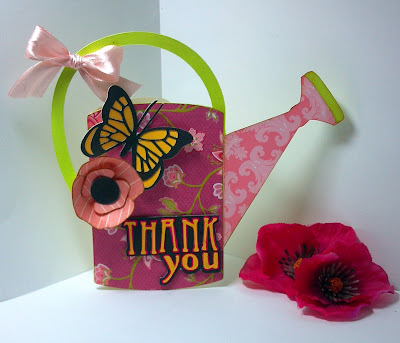 The watering can card is adorable!